I might be a little biased in reviewing this movie, however this was one of my favourite films at the movies and when I heard it was coming to DVD, albeit a little late, I was absolutely thrilled to bits. 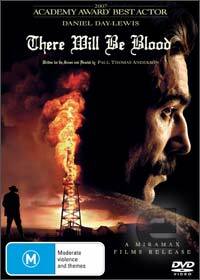 The story of There Will Be Blood revolves around the life of Daniel Planview, an oil tycoon who is on the rise. With crude and dangerous equipment, one of Planview's workmates is crushed in an accident and his baby son is left fatherless, until Daniel decides to take him under his wing as his own son. As the story progresses, Daniel Planview remains in an oil rut, unable to further his riches until one day, a local from a remote town sells him a map to oil on his father's ranch. A deal is brokered and Daniel Planview and his son, H.W. make their way to the owner of the ranch, only to be sidelined by the owners son, a strange and charismatic preacher named Eli Sunday (Paul Dano) who holds the townsfolk in the palm of his hand. Eventually making a deal with Eli Sunday in a strange agreement where Daniel Planview must build a church for the preacher, he soon begins to exploit the town of its oil and when an accident occurs to H.W., Eli Sunday blames the oil tycoon for not honoring their intended deal. From here, the story moves into a higher gear and truly makes this movie a unique experience. The star of the movie is Daniel Day-Lewis himself who is truly outstanding as Daniel Planview from his mannerisms to his accent... perfect! The theme of the movie revolves around a plethora of human values from love, hope, greed and corruption that is masterfully directed by Paul Thomas Anderson which makes There Will be Blood one of the most gripping movies of the year. Not once was the story predictable and the ending will leave you reeling in your seats. With stunning video and audio quality, the only downside to There Will be Blood is that the special features which are a little lacking but it still gives the viewer some behind the scene insights into this amazing movie!